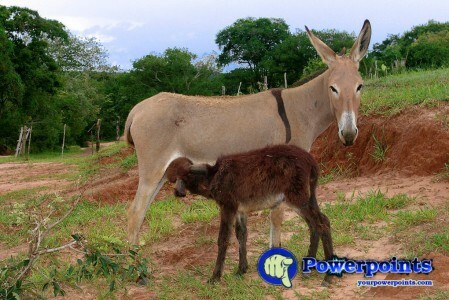 The donkey, is a domestic animal of the equine family. The African wild ancestors of donkeys were first domesticated at the beginning of the fifth millennium BC. C., practically at the same time as the horses of Eurasia, and since then they have been used by the man like animal of load and like cavaladura. The appearance of agricultural machinery has led to a considerable decline in their populations. Copyright © 2017 - wwwyourpowerpoints.com. All rights reserved.